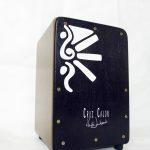 Cajon & Hangdrum! What a combo! First time I played with a hangdrummer….. last weekend whilst out busking, I jammed with this fella before Fernando’s Kitchen (my band) started cooking…. I really didn’t know these drums were so pricey though till the fella told me :-)!!!!! Check out this video of us jamming in London, at the cajonbox studios! What do you guys think of these hang drums? I thought it was just awesome. I love the rich sound you guys produce. Is there a cd of you 2 together? Great to hear from you! 🙂 Get a good cajon and it will clear up any issues with your back, as you don’t need to reach down/stoop down to get the bass sound out with a good cajon! I didnt know these drums at all. Just got an impression via YouTube. This guy plays a melodic theme and improvisational variations on 2 HDs. Its great!